You are here: Home / Thailand Guides / Thai Superstition and The Face on The Mud Flap. Thai Superstition and The Face on The Mud Flap. I would imagine if you have spent any time on the road in Thailand you will have noticed a face, either painted or in sticker form, on the mud flaps of Thai wagons and trucks. The face on the mud flaps has a familiar look about it but you can’t put a name to the face, maybe like me you thought the face was of one of the Bee Gees, even though it’s a little strange for a Thai truck driver to have some sort of fascination with the Bee Gees. So who is the man on the Thai truck mud flaps ?. It was by chance whilst browsing through a book about Thai oddities and superstitions that I saw a photo of a Thai truck with the same picture of the face on the mud flaps, the face I have seen so many times on those brilliantly painted Thai trucks and wagons, I was beginning to think it was just part of the decoration. But alas, all is revealed, the man on the mud flap is “Frank Serpico”, the character portrayed by Al Pacino in the cult 1973 movie of the same name. Serpico, the face on the mud flaps of wagons and trucks in Thailand. 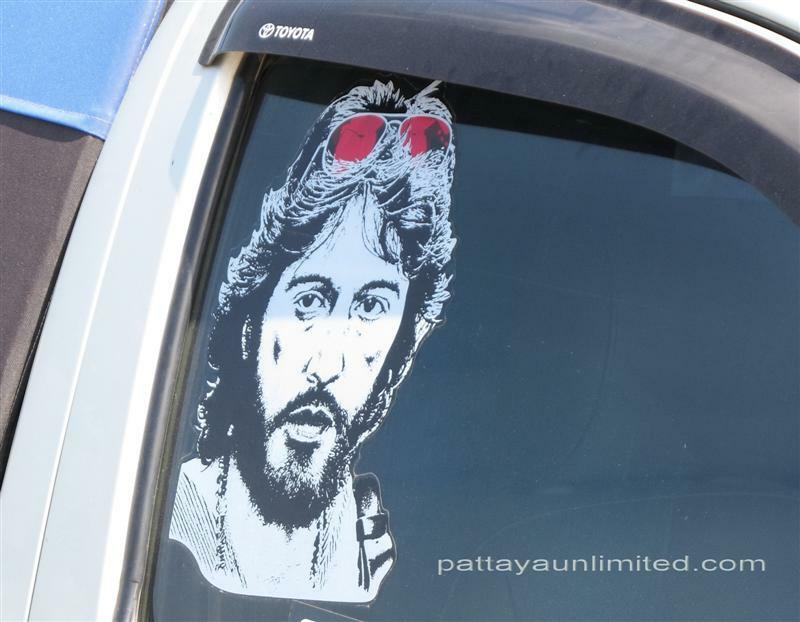 Unfortunately, all the times I’ve seen Thai trucks with the face pictured on the mud flaps I never had a camera with me, fortunately I did have my camera with me when I spotted Serpico (pictured above) stuck to the drivers window of a pickup truck in Pattaya. Why do truck drivers in Thailand have pictures of Serpico on their mud flaps ?. You probably guessed by now that Thai people are a very superstitious bunch, Thailand is a superstitious hotbed, evidence of which is all around you in the shape of Spirit Houses, sacred fig trees, the decorated prows of Thai boats, waving cats, Nang Kwak the beckoning lady and a host of other amulets and mini shrines. Just as Nang Kwak is employed by Thai shop keepers to attract customers, Serpico is used by Thai wagon and truck drivers, not for good luck but to discourage the attention of corrupt Thai police officers. Are Thai truck drivers really that superstitious ?. The average Thai driver will have his car blessed by a Buddhist Monk, and have an amulet hanging from his rear view mirror. A Thai taxi driver often has many amulets hanging from the rear view mirror, a Buddha figurine and many more amulets on the dashboard, this is because he not only has his own destiny to protect, but the destiny of many unknown passengers, therefore he needs extra protection. Thai truck drivers also need this same protection. You may have noticed that many of the older style Thai trucks have fancy metalwork along their body, these include the “Sun God”, a swan boat, even petal shaped washers, all these symbols represent speed, strength and protection. Like the rest of these religious and superstitious symbols Serpico is more than merely decoration, you might say he is there “To Protect and To Serve”. In the 1973 movie Al Pacino played the part of Serpico, an undercover policeman fighting corruption within the New York Police Force, his targets were policemen ‘on the take’. For this reason Thai truck drivers have adopted him as a symbol to protect them from corrupt police officers.